Miners in the outback town of Lightning Ridge — the site of the world's largest-known deposits of black opals — say they may have to stop mining as a result of skyrocketing costs from regulatory changes, reports the Australian Broadcasting Corporation. State government withdrawal of collecting compensation for land use has increased costs because miners must now enter into private agreements with landholders to use the land, said the Lightning Ridge Miners Association. Additionally, the abolition of levies to keep up roads and rehabilitate mining sites plus a jump in required government security deposits has further driven up costs. A representative for the miners' association said they have noticed a shrinking of the industry, citing the decline in the last 10 years of mining titles from around 6,000 to about three now. If the opal industry collapses, the town and local businesses will not be able to survive. Local opal miner Sebastian Deisenberger said the industry had dramatically changed over the last 20 years such that people can longer afford to mine a claim. "People are not prospecting, they're not going out mining then because there are uncertainties around what's going on," he told ABC, adding miners will have to abandon the town if things don't improve as they will not be able to open up new ground. The miners' association has started a petition to the government. Lightning Ridge is located in the state of New South Wales, about 750 kilometres northwest of Sydney. According to the Guinness Book of World Records, Halley's Comet Opal is the largest uncut black opal in the world at 1,982.5 carats and is worth approximately $1.2 million. 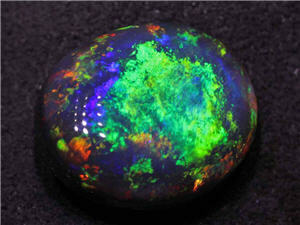 Opals are the national gemstone of Australia, which produces 97% of the world's supply.